The concept for this label came out of the old garage days of music, where bands would practice in garages, and record their stuff on some TASCAM 4 track. They would then proceed to replicate their tapes on a “duplicator”, like their parents dual tape stereo. On occasion, they would venture to a “Local studio” – usually in someone’s bedroom or trailer, and make their demo. Sometimes they would “spurge” and buy a bulk of these cheep white 99 cent tapes, and maybe some cheep flimsy plastic covers to mass produce their stuff. This MP3 “label” is based off that concept: that not everyone is going to mass produce their artisanship, mostly because our recourses are limited. We don’t have the allowances or the parents open pockets to go burn the $50 to record and mass duplicate our “masterpiece”. Electric Garage Demos finds pleasure in doing things the old way. Yes, the equipment is a little different, but the spirit is the same. This is a bare bones, grass roots, indie label full of music hobbyists, recorded in garages, home offices, and make-shift bedroom studios. The price for the albums for sale is up to you. The pricing options generally start at 1.99 and go to 9.99 (based on the artist's requirements for compensation). You determine how much you can and/or want to dish out. If you are in need of music for your media project, PLEASE contact us. We are not overly-pricy with the license thing, especially if you are doing any sort of college project. If you are a home musician/hobbyist, and would like to have your music featured here, please drop us an email! Our biggest requirement is that you should have a copy of What About Bob (or at least hope to one day own a copy). Many of our artists own multiple copies! If you are looking for a fundraiser, please let us know! Our Guarantee: If your mp3 breaks within the first 30 days, we will refund your money (minus S&H). 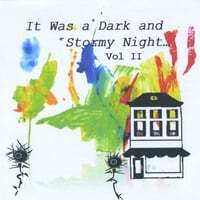 This section contains albums of unique variations on familiar tunes. 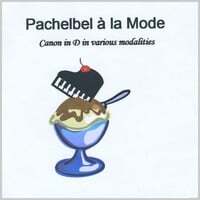 Variations can vary from techno to new age, blues to rock. 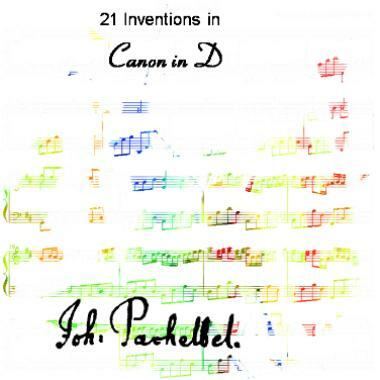 21 Inventions of Pachelbel's Canon in D is by far the most popular piece in this collection, having sold hundreds of albums and thousands of singles. What Child is This was designed around using a mixture of different genres and time signatures. 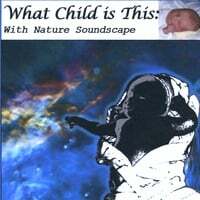 It has 2 variations - one with Nature Sounds, and one with just instruments. 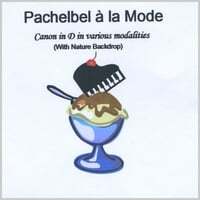 This Album came out of a love for Pachelbel's Canon in D Major (aka Kanon und Gigue in D-Dur für drei Violinen und Basso Continuo, AKA Canon and Gigue in D major for three Violins with Bass Acompanyment), and a love for a unique mixture of sounds and styles. Multiple Time signatures, Modes, genres, rhythms, instruments, etc, were incorporated, including waltz, 5/4 time, cut time, Minor, Locrian, Chromatic, banjos, harp, guitar, piano, organ, flute, synth, accordion, whales, birds, and more. 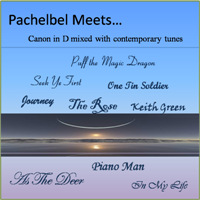 Way, way, way long ago, when this album first came out, it was called Pachelbel's Journey, and was about a gnome named Pachelbel and his mystical journey. 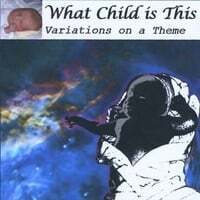 This album contains multiple variations of What Child is This in various time signatures, including: 3/4, 4/4, 5/4 and 6/4. It then uses those time signatures and embraces various ambiances, including Piano, Orchestral, Electronic, Rock, and Bells. This section contains pieces of art that are New Age, Ambient, Folk, Hymnal and other various forms of Easy Listening (though some would argue calling Phloide trying to sing "Easy Listening"). 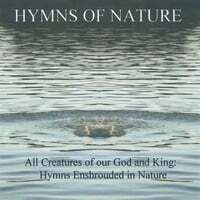 Hymns of Nature is an arrangement of hymns over the sounds of Nature. This album tells a musical journey through life, and then concludes by playing the entire album in reverse, taking us back to where we begin. The album titles and motifs reflect the artists unique studies and observations of the world around him. 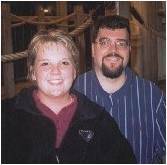 This is an album they did together as a chance to do something that they both enjoy: she got to play hymns, and he got to mess around with his programs. These songs are a collection of songs Carpets and Dolphins did for their own wedding. It's in the same order that it appears on the wedding video. Like with their other projects, Carpets did the "playing" and Dolphins did the "arranging". The more contemporary it sounds, the more likely Carpets chose it. The more "hippie / Jesus People" it sounds, the more likely Dolphins chose it. But they agreed on all of them. Look out your window, see the earth. Where did it come from, who gave it birth. Where did it come from, where will it go, where will it go? Don't you wish you had the answers, well, I know. See how the rain falls, who made the sky? It's never ending, and you wonder why. Don't you wish you had the answers, well I know. Just look out past the stars, look to the one who put them there. He, He made them all, and He gave them to us to share. Yes He made them all, and He's gonna take them all back someday. Don't you just wonder, what lies ahead? There's peace in knowing, what Jesus said. Where did you come from? Where will you go, where will you go? Don't you wish you had the answers? My heart is glad that You've called me Your own. For when Your eyes are on this child. First, help me just to live it, Lord. til the work on earth is done. Use me Lord, glorify, Your holy name through me. Lord of the ages, God before time. We are a vapor, You are eternal. Love everlasting, reigning on high. Be unto Your name, be unto Your name. Jesus Redeemer, mighty to save. I guess I’m older, I guess I’ve changed. That nothing lasts, except the grace of God, by which I stand, in Jesus. I know that I would surely fall away, except for grace, by which I’m saved. I vowed to serve You, when it was brand new. And I bet, I could deny you too. But nothing lasts, except the grace of God, by which I stand, in Jesus. Im sure that my whole life would waste away, except for grace, by which I’m saved. and the hill to the cross. is the body of Christ. that we will live, just as He died. The painting used as the backdrop is a painting done by my 2 year old son. Stick your silly slogan in: Everybody sing along. For the new Smurf daddy whack give a dog a bone? yesterday is never coming home. Stand up and admit, its easier to commit when the future is unknown. Do we understand or do we simply believe? Has systematic truth truly made us wise? Are we just a cosmic glitch with a side of curly fries? And hope nothing more than chasing after the man on the moon. The blinds stay closed to block out the horizon. There’s so much I am unsure of. Did you know that your baby boy has walked where angels tried? Dr Zaius is an experiment in taking the old familiar meets modern experimentation. They hope to release other experiments with classical pieces once they can get everybody to calm down. Berdoax Fozle Qozletong is a team that is experimenting in “blind sound art”, where they create sounds usually based around some musical theory and whack it, mix it, dissect it, re-mix it, and smoother it with experimental ideas, all without listening to it while they work on it. These are 2 of the releases that have come out of that project. There is a proported 3rd album, though it has yet to surface. 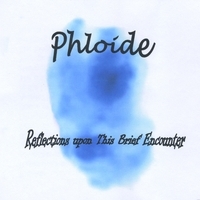 Phloide is an artist who can’t make up his mind what he wants to sound like (not that it’s all that bad). But you will see other pieces from him in other sections, including Electro rock, New Wave, New Age, and Piano Folk. It is also rumored that he once was a bass player in a metal band. The concept of this album is centered around the Infinite Monkey Theorem, which implies that if you have an infinite number of monkeys randomly beating the begeaters out of typewriters, they would eventually concoct something intelligible. 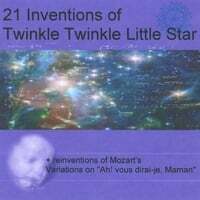 We took samples of various variations of Twinkle Twinkle Little Star, indiscriminately cut them up, integrating them with erratically dissected samples of Mozart’s 12 Variations, and haphazardly displaced them using various audio effects to see if it would turn out feasibly comprehensible. We don't normally create our own samples (though we are not opposed to it). We like to take samples and tracks already generated by other fellow artists (so don't be surprised to find other artists on this site being resampled in future projects). This Sound Art Project was completely composed/constructed without listening to it. It was designed around musical and mathmatical theory, spacial concepts, and experimentation. Each song was "created" within about one hour time slot. This album is exactly 42 minutes long with each "song" lasting 4:12, and is designed to stream continuously (no breaks between songs). 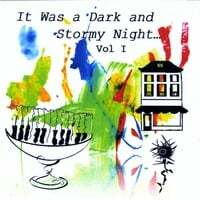 The artists who composed this went in with a plan (sort of), of using various chords, rhythms, scales, etc, to create various sample tracks, and then whack those tracks to pieces. They also tried to implement a couple of repeating themes. If you can't tell by the names of the songs, this group has trouble coming up with song names, so they tend to just sporatically use whatever comes to them. 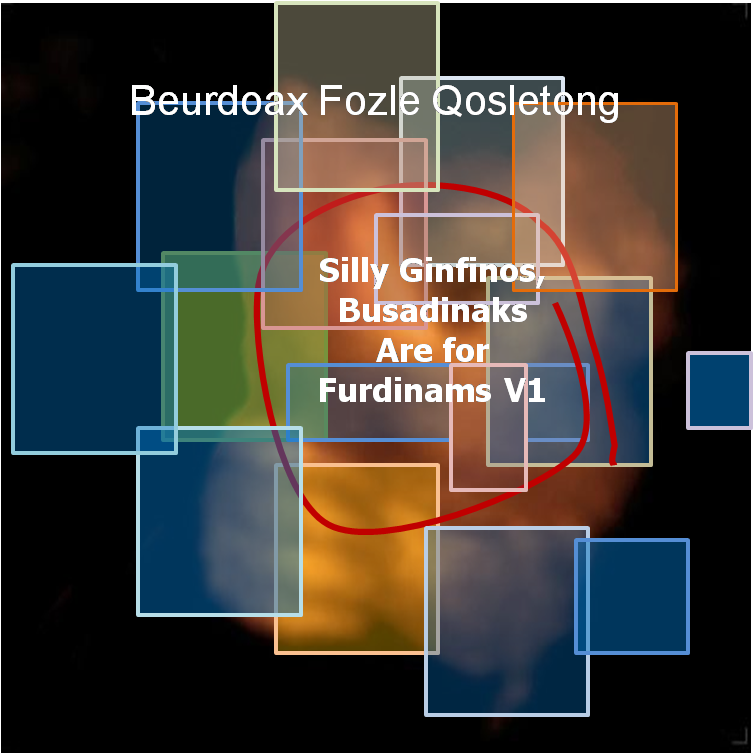 There are rumors of where the BFQ name came from, but it probably came about by just banging on the keyboard or creating a random letter generator. Originally, this album was only to be 21 minutes, but order now, and we will double the length of the album. 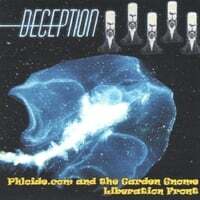 It is based on the arrangement of the prior album, except backward, some slight additional experimentation, and minimalist drums and bass added. The rhythm section was constructed, and then mixed in without listening to it. It was designed around musical and mathmatical theory, spacial concepts, and experimentation. They had the same intent with the time construct... they wanted to compose and integrate the rhythm section in as short amount of time as possible. It is blender time! If you were to take the framework of many of the popular hymns of the evangelical church over the past two centuries and mix an industrial bed of chaos beneath it, you would be close in breathing in Phloide.com. I love the industrial-laden music that has come through the pipe from Circle Of Dust, Generation, and some of the elements of Klank. I even enjoy some of the techno-trance music that has passed through the underground. “Worm As I” is a whole other animal to me. Some might consider taking the hymns and experimenting with them somewhat “sac religious,” going so far as putting a veritable bed of nails under it all, but this is creativity at its finest. To the casual listener, this can sound redundant at times. You have to treat this deeper than background music to gain appreciation for the thought put into it. This won’t be for everyone, but this emanates independent and underground. At points, while listening several times to this, I could hear resolution in a musical sense. Growing up with the hymns, I basically have all of these committed to memory. I hear elements of the lyrics, at times, even resolve. Thank the Lord that we have, as his creation, been given the ability to create music, no matter how diverse or weird it may sound to some. Experimentation can be a beautiful thing, if taken with a bed of nails. We stole this from Rivot Rich's sites and posted it here (we hope he doesn't mind). He's not really on our label (yet). But we love his stuff, and he is a real inspiration to us, so we thought we would help promote his stuff. He has it currently for free download on various sites (reverbnation, soundclick, myspace). These are from a minimalist artist who wanted to try taking a familiar classic and run it through various modalistic treatments. Each minimalist variation uses a different instrument, pending on the ambiance each variation called for. The albums we currently have in this category are from Phloide (And Now To Sum Things Completely Different & Deception) and an old release from the famed underground indie metal band Overdrive. The Overdrive album is a compilation of all the different materials we had access to from over their various incarnations. It is a tribute album to the founding member and drummer, Bobby "The Basher" Collins (who also went by the name Animal). 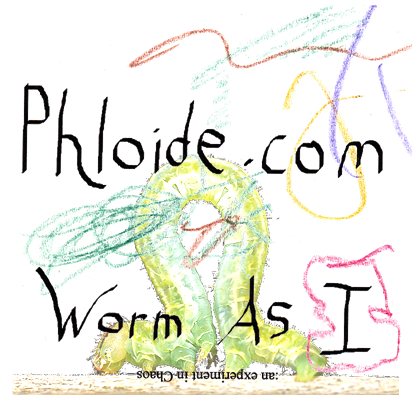 The written content of the songs is perhaps the most amazing aspect of Phloide's "Now for Sum Thing" album and is persistently humorous and deeply thought provoking throughout. If you are a fan of British Humor, Dr. Seuss, or nursery rhymes (or all of the above) you are really in for a treat as the writing of the songs is riddled with humorous references to the likes of Monty Python, Hitchhiker's Guide to the Galaxy, Spinal Tap, Yertle the turtle, Fox in Socks, Horton the Who, Peter Rabbit, the Cheshire Cat, Charlotte’s web, Mother Goose, Goldilocks, and even H.R. Pufnstuf. I can also detect some subtle tips of the hat to great classical rock musicians such as Pink Floyd, the Eagles, Jimmi Hendrix and Rush. The lyric sheet is quite extensive and thorough with the lyrical imagery delivered in mostly a poetic or metaphorical style. The written content of the deeply thought out song lyrics are guaranteed to tickle your brain and challenge your thoughts in the subjects of the validity of the theory of evolution and some aspects of quantum physics, mankind's treatment of his fellow man, and the significance of One's life and search for meaning in God's Creation and Universe. At least these are some of my interpretations so far of the album's lyrical content and deep meanings, and you are likely to come away with your own unique interpretations of the meanings of the songs as you embark upon the adventure of exploring this great album. 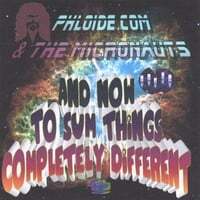 In conclusion, Phloide.com and the Micronauts "And now to Sum Things Completely Different" is a brilliantly written collection of skillfully crafted fresh and innovative underground rock sounds that is sure to appeal to fans of Industrial, Gothic, and Alternative Rock alike. With Tinky Winky And his brave little toaster. Yet we all want someone to say well done. Will the answer be forty-two guess it pends on the question. Yes, the name is a take off on the Monty Python Movie. When I woke up in the morning. As I walk down Mulberry St.
OVERDRIVE was a Christian Heavy Metal Band that I was a part of from 1988 to 1991. Joe, Stacy and I met in 1985. I had known Doug since we were kids. We played together in bands with names like: "Damascus", "White Knight", and "Heaven Quest". When we finally found Jimmy Prior, we knew we had the perfect line up. I believe we named ourselves OVERDRIVE because we were driven by the One OVER us!!! 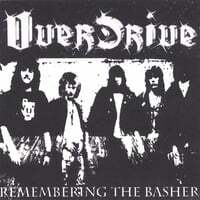 We recorded two tapes together: "OVERDRIVE" in 1989,and"A Grave Mistake" in 1990. All good things must come to an end, and so did OVERDRIVE. We all have moved on to other things in our lives now, but we still keep in touch. Overdrive was a Christian gothic power metal band from Blacksburg/Radford, VA. They existed in some incarnation from around 1985 until around 1992. On the Radford Side, there was Bobby Collins on drums and John McGuire on vocal. I think there were supposedly some others, but they never showed up They were called Damascus. They eventually snagged a bass player, Steve, and guitarist, Jimmy Prior, from another metal band called War Angel. It was during one of the concerts that Steve was not able to perform, so the keyboard player had about a week to learn how to play Bass. he tried to do it Geddy Lee style (one hand on bass, one on keyboard). Over the years, there were several member changes, costume changes (there was a Motley Crue era, a Leather and Jeans era, a spandex era), and the silly nickname phase: Bobby "The Basher" Collins (a.k.a Animal), John "Rambo" McGuire, Doug "Brandon Wolf" Levy, Joe "Biff" McLaughlin, Stacy "Stace Sterling" Puckett. One of their songs (When the "Saints") was even featured in a national mailing of Benson's new releases catalog for 1991, but the song was pulled from the compilation due to some controversy over the use of the word "saints". There have been a couple of reunion shows over the last decade, and another wouldn't be ruled out if we didn't all live in different states at the moment. Unfortunately, Overdrive's original drummer, Bobby Collins, passed away a few years ago at the age of 30, due to no fault of his own. His is missed by all who knew him. An odd footnote to the Overdrive history: the very last incarnation of the band included Jimmy Prior on guitar, Doug Levy on vocals, Steve Ryan on bass and Dave Shelton on drums. So, it was 3/5 War Angel and 1/5 Overdrive...perhaps it should have been called "Woverdangle"?? A very brief period--only one gig was performed at St. Paul's United Methodist Church in Christiansburg, VA on 1-16-93. There is a very poorly shot video of the show. Shortly thereafter, "Jimmy moved, Doug got married... should have known it wouldn't last long"... wait, isn't that a Bryan Adams tune? Anyway, just a bit of lost trivia. Blonde Vinyl was a label that has inspired me for years, even though it is long and gone. For its day, it was extreme in its experimental vibe: willingness to envelope unique Avant-garde music for a demographic and platform that tended to shun the bizarre and unique. The Founder of the Blonde Vinyl was Michael Knott, and a list of the bands can be found at this excelent tribute site. If you are a former Blonde Vinyl artist/group, and would like to post some of your stuff up here, I would be more than willing to see what I can do! just email me!